Hulu’s streaming service was already available on nearly all major platforms, including desktop, mobile, tablet, gaming consoles and other TV-connected devices. However, it was lacking support for one major computing platform: Windows 10. That changes today, as Microsoft and Hulu announce a new version of Hulu application, which includes Windows 10 specific features like Live Tiles and universal voice search via Cortana integration, for example. Before today, Microsoft only had a Windows 8 version of the Hulu app available – this new app is meant to be a better alternative for those who have upgraded to the latest OS. 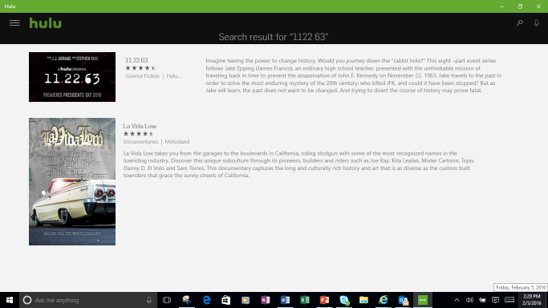 In the Windows 10 Start Menu, the Hulu’s support for Live Tiles will give you a preview of what’s inside. That is, the tiles will feature still images and those that pan across the tile in order to showcase the content that Hulu’s app is currently promoting on its masthead. This is typically five featured shows that the service is trying to call attention to. However, according to Ben Smith, Hulu’s SVP of User Experience, these Live Tiles will be enhanced in the future to offer an even more personalized experience for end users. For example, they could take into account which shows you watch and which have new episodes, and then show you images related to those items instead. 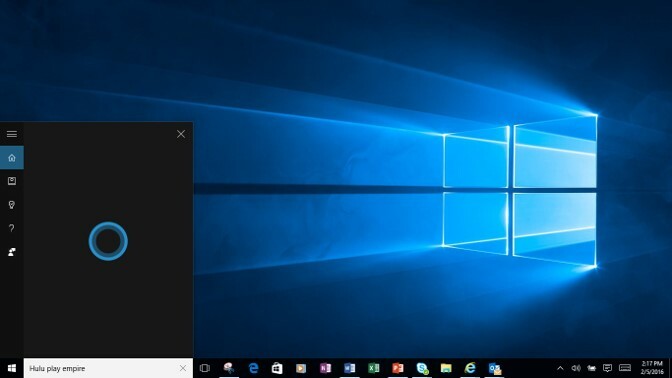 Meanwhile, the other standout Windows 10 feature is the built-in voice search powered by Microsoft’s virtual assistant, Cortana. Similar to other Cortana integrations in Windows 10 applications – as in Uber, NPR or Netflix – you’ll need to say “Hey Cortana” to kick off your voice command. For example, you could say “Hey Cortana…Hulu watch Empire.” Talking to Cortana is a bit more involved, when compared with the way that voice assistants work when on dedicated streaming media players, like Apple TV, where you can just dictate what’s to be done (e.g. “Play episode 3;” “show me funny movies”). If anything, the experience is more like communicating with Amazon’s voice assistant Alexa on the Echo speaker where you have to call her up by name, then tell her which app needs to be launched. At launch, Cortana can only perform a couple of tasks on Hulu: it helps you search for shows or episodes, and it can play a show for you. Here, the app is smart, too, as it will resume the show or series where you left off. That is, if you were halfway through an episode it will pick up where you had paused it earlier, and if you were working your way through a series, it will play the next one in line. This is not the first Hulu app to have some sort of voice integration – the company already has an Apple TV app as well, but Smith says it’s too early to talk about how much consumers are using voice when interacting with a service like Hulu’s. “We’re looking at how users interact with content and voice,” he says. “For us – and I think this is true of everyone investing in voice – it’s a long-term play. It’s not about success in the short-term…it’s about understanding what in the eyes of the user will be successful,” Smith explains. Also of note: the new Windows 10 application also has a different look-and-feel from the older Windows 8 app, Smith notes. On Windows 10, Hulu’s user interface has been brought completely in-line with how it appears on other platforms for a more consistent experience between devices. As a Universal Windows 10 application, Hulu’s app will work any supported device, including PC, tablet or phone. The app is available for download from the Windows Store this morning, and will include a free trial for new users.